U.S. Secretary of State Rex Tillerson delivers remarks on the U.S.-Korea relationship during a forum at the Atlantic Council in Washington, Dec. 12, 2017. Hours after Secretary of State Rex Tillerson caught worldwide attention Tuesday, appearing to strike a different tone toward North Korea, saying “we’re ready to have the first meeting without preconditions,” the White House issued a statement putting a damper on any hopes of a possible diplomatic opening. “The president’s views on North Korea have not changed. North Korea is acting in an unsafe way, not only toward Japan, China and South Korea, but the entire world. North Korea’s actions are not good for anyone and certainly not good for North Korea,” press secretary Sarah Huckabee Sanders said. On Wednesday, State Department spokeswoman Heather Nauert denied there was a shift in U.S. policy toward North Korea. “The secretary was not creating any new policy. Our policy remains exactly the same as it was, the very same policy that we have talked about in this room for months and months now. First and foremost, diplomacy is our top priority,” Nauert told reporters. She said Tillerson and the White House agree that now is not the right time to talk to North Korea, noting that Tillerson had gone on to say Tuesday that serious talks could happen only after “a period of quiet,” without further nuclear and missile tests. North Korea has conducted a series of ballistic missile tests in recent months, including one in November that Pyongyang claims could now put the entire U.S. mainland within its range. Nauert stressed that the goal of the U.S. and its international coalition of allies is the denuclearization of the Korean Peninsula, which North Korea strongly rejects. 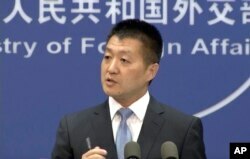 FILE - Lu Kang, spokesman of the Chinese Ministry of Foreign Affairs, speaks to reporters about the international tribunal's ruling on the South China Sea during a news briefing in Beijing, July 12, 2016. China was quick to welcome Tillerson’s comments offering talks with North Korea without preconditions, which came as South Korean President Moon Jae-in began a four-day state visit to China. Speaking at a regular press briefing Wednesday, Chinese Foreign Ministry spokesman Lu Kang said Beijing welcomes all efforts to ease tensions and promote dialogue. China has put forward a “double suspension” or “freeze for freeze” proposal that would require North Korea to halt all ballistic missile and nuclear tests and the United States and South Korea to halt all military exercises. “We hope that the United States and North Korea can meet each other halfway and take meaningful steps on dialogue and contact,” Lu said. Russia also welcomed Tillerson’s perceived overture. FILE - Sergei Ryabkov, deputy foreign minister of the Russian Federation, addresses the Nuclear Nonproliferation Treaty conference at United Nations headquarters, May 4, 2010. 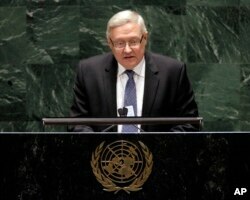 Ryabkov added, however, that Russia would like to see “practical actions” follow such statements. During his remarks Tuesday, Tillerson had made clear that diplomacy could be successful only because the U.S. military was fully prepared to act if diplomacy failed. Late Wednesday, the State Department announced that Tillerson would participate in a U.N. Security Council ministerial-level briefing on nonproliferation and North Korea on Friday in New York City. Tillerson will also meet with U.N. Secretary-General António Guterres Friday.